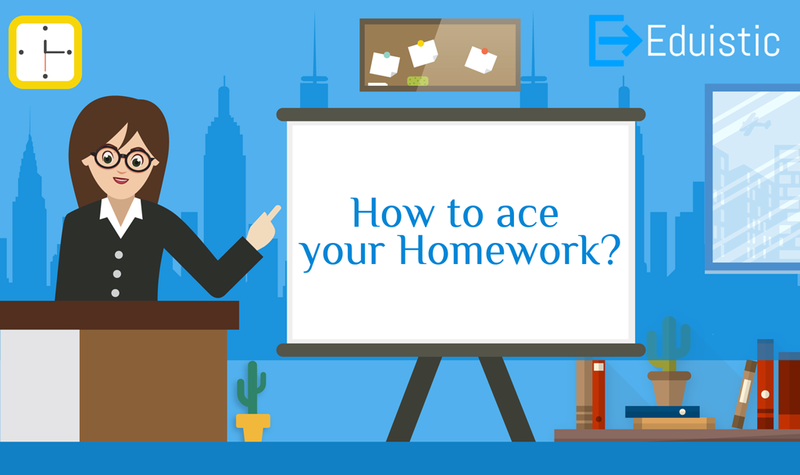 How to ace your Homework? – Eduistic: Need Expert Help with your Studies? Home Assignment or homework is a predefined set of tasks, which is given to the students by their respective subject-guides or teachers to get completed outside their classroom or teaching premises. This practice is usually carried in every schools and academic institution to critically examine that the topic, the students have been taught in the classrooms, is well assimilated by them or not. There are variety of home assignments given to the students like solving a set of questions, reading and understanding a topic, researching a topic, carrying out a survey, a project and many more. The basic objective of assigning homework to student is to reinforce the matter, which has already taught to them by their respective faculty. Beside this, when a student regularly complete all his/her homework the he remains updated to all the topics that he has been taught in class and unknowingly he gets prepared for his upcoming examinations. Besides getting prepared for exams, when a student at home tries hard to solve a question of his homework, strive to break the ice and get the correct answer, integrate all his abilities and skills to a new situation. After this he undergoes a brain exercise, which is very essential for his mental growth. Thus, homework is very beneficial for a student’s intellectual growth. Before attempting the homework he must go through the questions or the topic of homework and figure out what has been asked to do. Study the homework related topics before initiating to avoid frustration while doing homework. Gather all the concepts and supplies the facts that you know or provided by the teacher. Plan and organize the various steps to be done. In case of getting stuck while doing homework, motivate yourself. Avoid distractions and seek for privacy for doing homework as it saves time and increases efficiency. Prepare a priority list of assignments that needs to be completed urgently and postpone those ones which can be delayed. Prefer daytime over night for doing assignments since our efficiency is high in day as compared to night hours. Start appreciating and rewarding after completion of each step of the assignment and always maintain a positive attitude. At last, a student should change his mind-set about assignments and slowly try to understand the importance of it in his academic front. Thus, if a student positively follows all the steps mentioned above, he may certainly be able to complete all his homework on time or even before time with improved efficiency, which will eventually provide him a great learning experience and help him to achieve academic excellence.